Whether you are looking to control traffic in a multi-storey car park, a bus lane, construction site or another type of premises, there are a number of different options available to you. Of course, employing traffic controllers to direct vehicles is one way to prevent unwanted access, but there are other methods which are considerably cheaper in the long run and more reliable. Speed ramps are an excellent way of restricting the speed of traffic as it moves around your site. Together with signage to warn road users, speed ramps provide an effective way of calming traffic. Our GA5750 speed ramp is made from heavy duty recycled PVC segments and available with embedded cats-eyes and high visibility yellow and black sections, providing an important visual notice to on-coming traffic. The GA5750 offers differing speed restrictions with two separate heights available, and it is also available in different lengths. Our sunken flow plates force mono-directional traffic, allowing traffic to pass over them in one direction but not in the other. They are made from steel but feature noise-reduction buffers which quieten the noise of the metal box moving back into position after a car has travelled over it. Our surface mounted flow plates are made from heavy duty chequer plate steel which makes them very robust. They are surface mounted and ideal for concrete applications, such as multi-story car parks or economy projects. 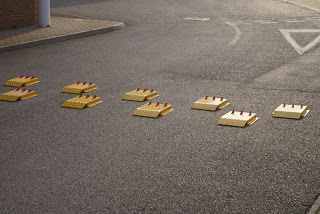 They feature a sophisticated spring action system which ensures they return to position after a vehicle has passed overhead. We also offer an even more robust version which is suitable for heavy goods vehicles, the GA5875HD.